Las Vegas real estate gambling revenue in October by less than one half of 1 percent from October 2005, the Nevada Gaming Control Board reported. The small revenue growth is due to the lucky baccarat players’ good luck on the Las Vegas Strip. The state’s gaming revenues, more than half, are generated by casinos on the Las Vegas Strip, which saw gaming revenues decline more than 5% in October to $532.19 million. For the fiscal 2007 year-to-date, gaming revenue from the Las Vegas Strip remains about 3% ahead of fiscal 2006. In Downtown Las Vegas real estate, gaming revenues were off by 1.67% to $59.69 million in October and are off by more than 7% for the fiscal year-to-date. Las Vegas gambling revenue nears $1 billion due to Nevada gambling losses of $1.1 billion in May, giving Nevada its fourth consecutive month of billion-plus of casino revenues including Las Vegas casinos. In Nevada, only January 2006 made the casinos more money. Despite competition from other domestic and international gambling jurisdictions, Nevada casinos also registered another month of revenue growth, up 9 percent from May 2005. 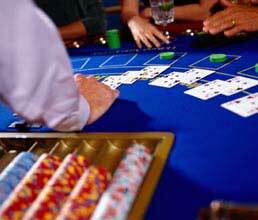 For the fiscal year ending June 30, Nevada casinos’ gambling win is up more than 12 percent. Slot revenues hit an all-time record statewide of $742.6 million, up 7 percent from last year. Slot holds averaged 6.25 percent statewide and almost 7 percent on the Strip. Double-digit revenue increases were notched by blackjack, increasing 13.8 percent statewide ($128 million) and 18 percent on the Strip ($95.3 million), and by roulette, which grew 19 percent on the Strip ($26.5 million) and 17 percent statewide ($32.4 million). Baccarat had a monster month, with volume of play up 44 percent on the Las Vegas Strip, which accounted for virtually all Nevada baccarat play. Strip baccarat revenues were just short of $87 million, on $202 million in volume of play. If gamblers flocked to baccarat, they fled craps, which lost 8.6 percent of play volume statewide and 13 percent along the Las Vegas Strip. Revenues declined comparably, off 19 percent on the Strip ($22 million) and almost 14 percent statewide ($34 million). In sheer dollar volume, the Las Vegas Strip dwarfed all other areas of Nevada, pulling in $962.6 million. In terms of percentage growth, outlying Clark County was the front-runner, increasing revenues 27 percent because of the additions of Red Rock Station Casino Las Vegas and Boyd’s South Coast hotel-casino. Besides the Las Vegas Strip, other regions measuring double-digit growth were Mesquite, continuing a bounce-back year in the border town, and North Lake Tahoe, where warmer temperatures brought 16 percent revenue growth. South Lake Tahoe was not so fortunate, falling almost 8 percent, as did outlying Washoe County. Termination of air service to Elko County that brought in 40,000 passengers per year is beginning to have an effect, according to Nevada Gaming Control Board Analyst Frank Streshley. Hence, a 10 percent decline in Elko County revenues was more than enough to negate 6.7 percent growth in Wendover, a popular drive-in market for Utah residents. Carson Valley also saw a big falloff in gambling revenues, down 9.5 percent, blamed in part on increasing fuel prices. Streshley said that rural revenues may have also felt the effect of one fewer weekend day than in May 2005. The smallest growth in Nevada was the 0.4 reported by downtown Las Vegas. Still, it was a gain in a downtown Las Vegas that’s had a long history of losses. Selling, buying or refinancing a piece of Las Vegas Real Estate today? Visit Fine Homes Real Estate for more information and VIP representation by a Las Vegas Luxury Real Estate REALTOR for investment Las Vegas Real Estate, 1031 exchange, condos such as Trump, Turnberry, Allure, Panorama Tower, The Signature, W Residences, RED Rock Residences, commercial, residential and Las Vegas land. Las Vegas gambling revenue nears $1 billion in may.